Bray, as it turns out, isn’t all Michelin stars and haute cuisine. If you happen to be in the area and fancy something a little more humble than the 3-star delights at The Fat Duck or Waterside Inn, there’s some proper, old school pub grub going down at Heston Blumenthal’s The Crown at Bray. For a chef at the frontier of molecular gastronomy, Heston and team have kept things surprisingly simple at this traditional, 16th century boozer since taking it over in 2010. The kitchen was recently refurbished to deal with more covers but the pub itself has otherwise kept it’s old-world charm through and through. Amidst the low-beamed ceilings and Caledonian ales on tap, you will find a menu sporting British pub classics from Prawn Cocktail and Sausage rolls to Burgers and Fish and Chips. Simple they may sound, but I hear recipe development here at The Crown follows the same elaborate and methodical process as per The Fat Duck and Dinner by Heston. We dined alfresco in their lovely outdoor garden area – recently reopened to usher in the Summer months ahead. The starters we ordered to share soon arrived. 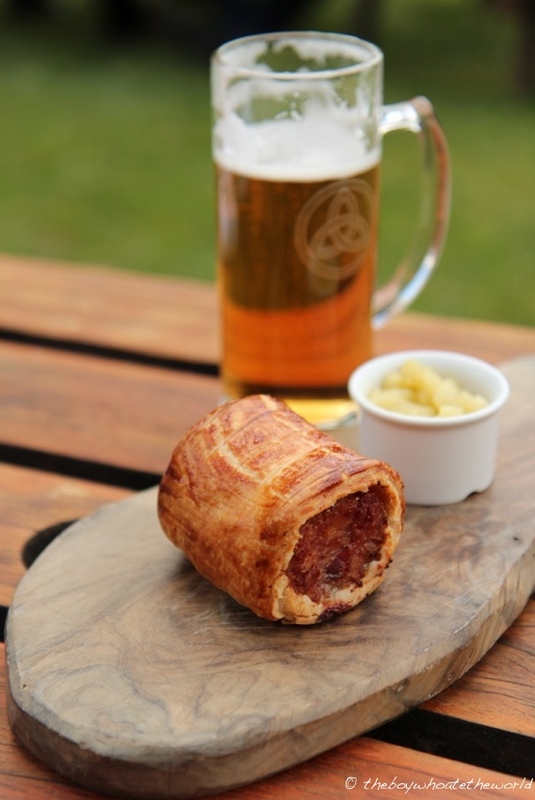 Their sausage rolls here are the sort of comfort food which dreams are made of – crisp, buttery puff pastry on the outside and packed full of juicy, well-seasoned sausage meat on the inside. The ‘trug’ of fresh baby vegetables, though extremely simple in concept, kept in tune with the ‘less is more’ ethos here. 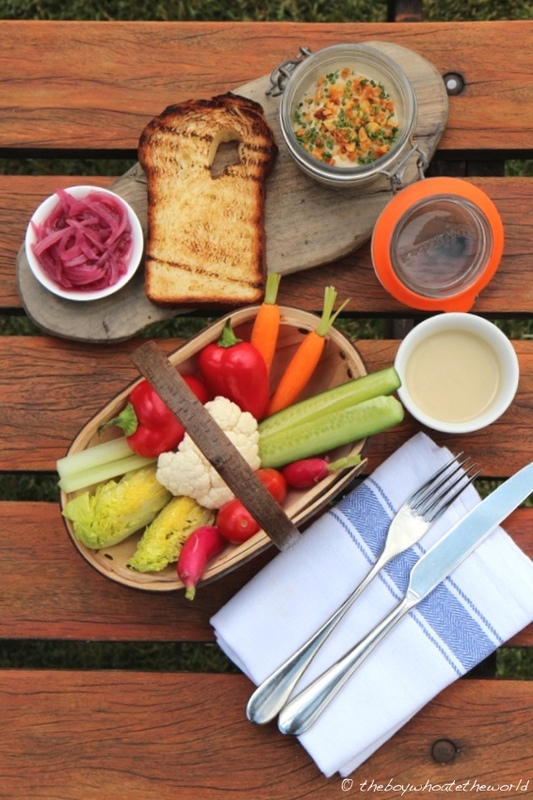 I loved the accompanying Bagna Cauda dip – the balance of flavours between the anchovies and slow roasted garlic was spot on and complemented the crunch and sweetness of the baby vegetables beautifully. Best of the lot of starters though had to be their Mushroom parfait. Creamy, earthy and smooth as a baby’s bottom, it was delicious with the toasted brioche and pickled red onion relish. Our main courses then followed. Steak Tagliata, served with plenty of rocket, parmesan and olive oil was summer on a plate. The rare, thin-cut slices of sirloin simply melted in the mouth like butter. I would have liked to have seen a bit more steak relative to greens though. 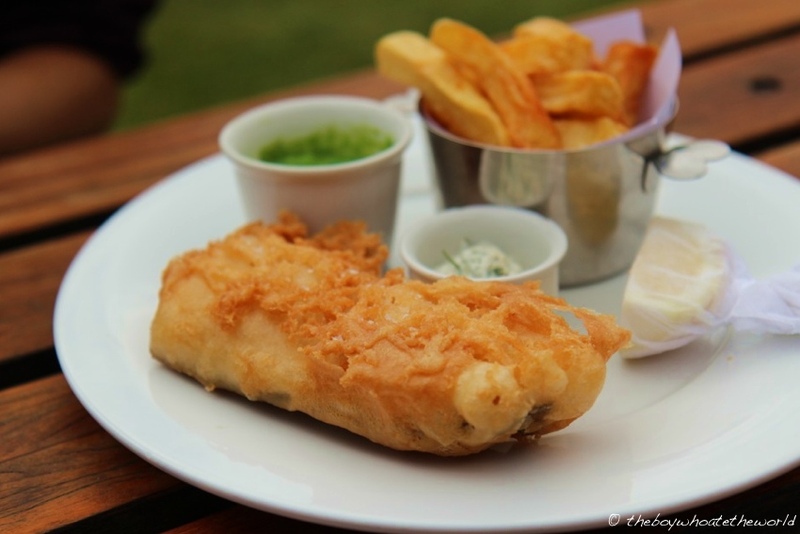 Their signature Fish and Chips however would prove to be the star of the show. The beer batter was crisp, air-light and greaseless. The haddock itself was flaky, moist and perfectly cooked on the inside. Even the crushed peas impressed – the subtle hint of mint and vibrant green colour was a welcome change from the often murky looking mush you get elsewhere. The level of care and attention to detail gone into the development of every element of the dish was clear. And the proof is most certainly in the pudding… for me, it’s easily one of the best Fish and Chips you will find anywhere in the country. 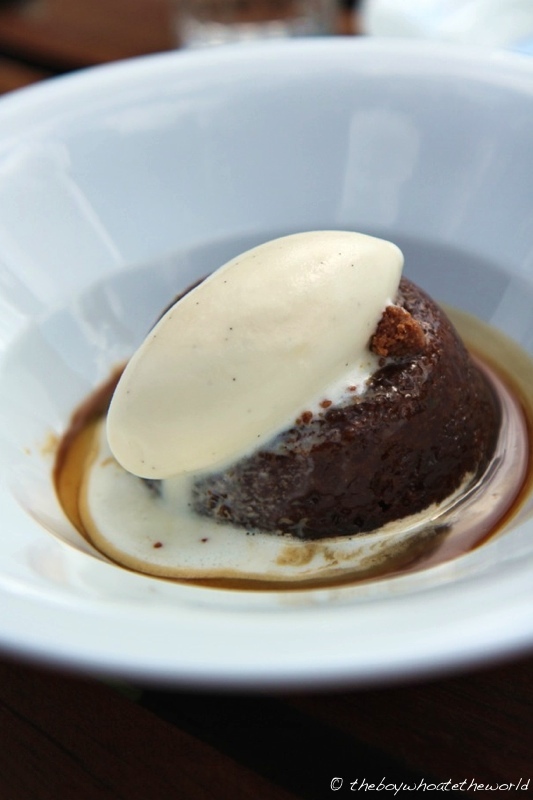 Save some room in your bellies for their splendid Sticky Toffee Pudding. Moist and decadent, yet not overly sweet, it was a match made in heaven with their creamy, house-made vanilla ice cream. With starters priced between £5 – £8, most mains in the £12.50 – £20 region and wines by the glass from £4 – £7, it’s all very decent value for the quality and attention to detail you get. 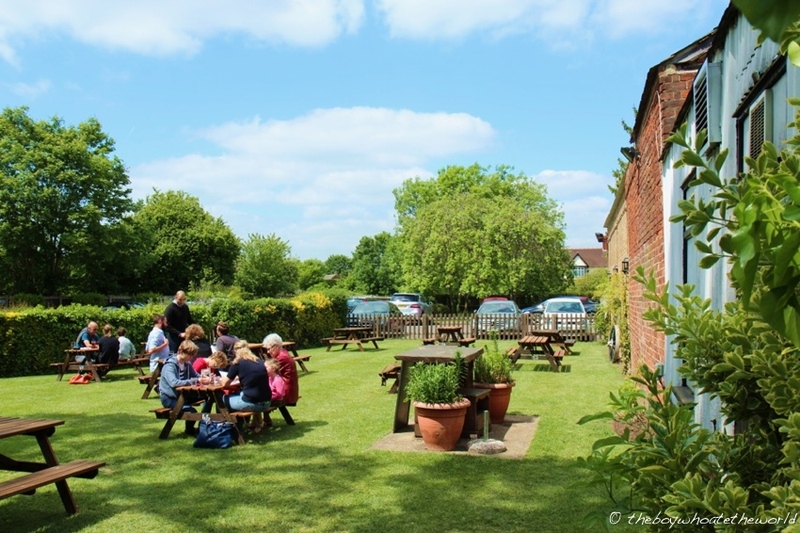 Service throughout our meal was also top-notch – attentive yet casual, as you would want from a small village pub. The depth of knowledge of all the staff is commendable. Here is a front of house team clearly in tune with their kitchen’s produce and cooking techniques. I’m glad that Heston and team have kept things simple and honest here at The Crown. With so much haute cuisine already going on Bray, it’s great to see a village pub sticking with tradition. No tinkering or mucking about. Just tried and tested classics, perfected. p.s.? I think relationships of this nature between bloggers and pr deserve a little more weight than a dismissive p.s..
@Pete: Fair point Pete, wasn’t intending to be dismissive & appreciate your feedback – will aim to make disclaimers more clear going forward. For what it’s worth, this blog is purely a labour of love. Yes, there’s the odd blogpost I do that’s an invitation from the restaurant & their PR such as this one, but the honest truth is I don’t make a penny from this blog and all views expressed are my own. Thanks for stopping by the blog in any case.